Don’t let its uninspired name fool you — MouseCraft is not related to Minecraft (or Warcraft, Starcraft or any other “crafts”). The latest release from popular indie publisher Curve Studios is actually a puzzler that plays out like a hybrid of Tetris and Lemmings. 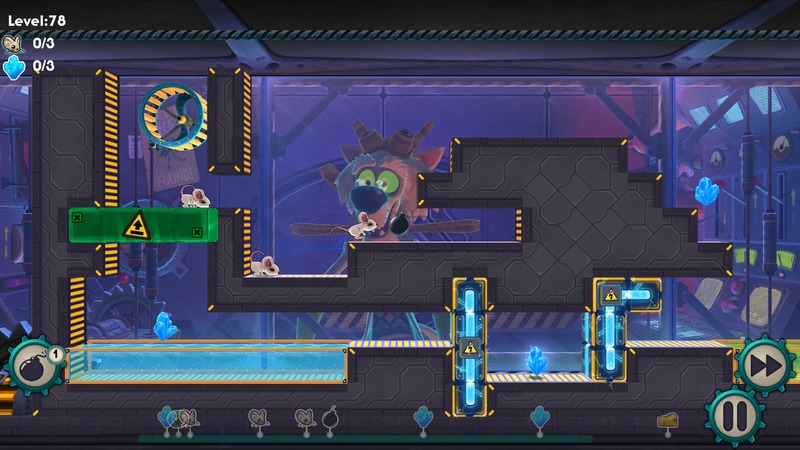 Under the watchful eye of a mad cat scientist named Dr. Schrödinger, your job is to direct groups of mice through increasingly tricky contraptions in order to help them reach their much-beloved cheese. This is accomplished by stacking “Tetromino” blocks in ways that will allow the mice to reach areas that they could not do otherwise. The blocks come in familiar Tetris-style shapes, and each level has a set amount that can be used. Every level contains three mice, and only one of them needs to successfully reach the cheese in order to move onto the next area. However, if you want to get a “golden cog”, you must get all three mice to the cheese while also acquiring any anima shards scattered throughout that section. These collectibles are often located in hard-to-reach areas, and it can require some serious thinking (and trial-and-error) to figure out how to get to them. Thankfully, MouseCraft provides an infinite amount of “undos” and restarts. With a simple press of a button, you can rewind back to your last block placement or all the way back to the beginning of the level. It’s all rather intuitive, and it makes it easy to try out new strategies without having to start all over (unless you want to). Even better, there is no timer so you don’t have to worry about rushing to beat the clock. If you’re impatient, you can also speed up the process by making the mice move much faster than usual. 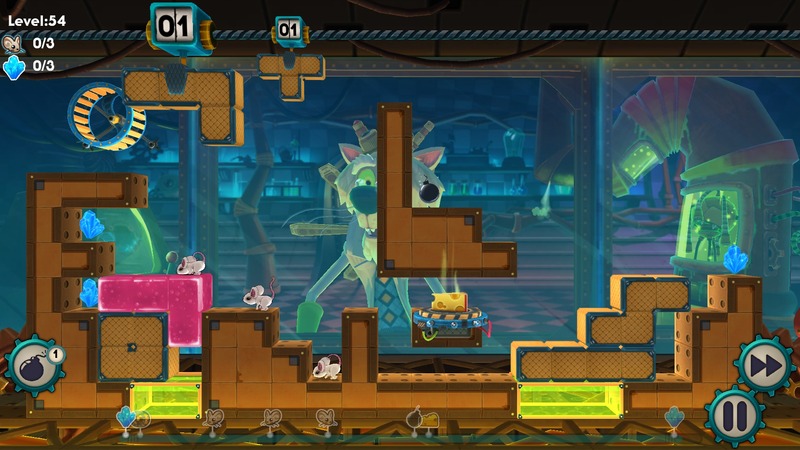 As the game progresses, new obstacles are brought in, including mechanical rats, water hazards, acid and explosive blocks. These additions help ensure that the gameplay is kept fresh throughout its 80 levels. For the creative-minded, there’s even a neat little bonus in the form of a level editor. It’s extremely easy to use, and it doesn’t take long to put together a snazzy level of your choosing. Unfortunately, there’s no way to share your creations online, something which I can only hope will be patched in at a later date. I would love to see what other players come up with, and including this ability would add quite a bit to the overall replay value. Still, it’s a nice surprise that it was included at all. The PS Vita version has no noticeable performance issues, and in fact the game is a natural fit for the system. Levels are generally small enough that they can be started and finished in a matter of minutes, and the system’s excellent standby feature makes it easy to pick up a puzzle and resume it at a later time. The game also utilizes the Playstation Network’s cross-buy and cross-save abilities, meaning one purchase nets all three versions (Vita, PS3 and PS4), and saves can be transferred freely to each system. In the end, MouseCraft delivers where it counts: its puzzles. There are quite a few head-scratchers throughout, especially when trying to get the golden cogs, and there is a real sense of accomplishment when you finally have that eureka moment and solve a difficult puzzle. This is a fun little game that can appeal to all ages. Who knew Tetris + Lemmings could be such a perfect match? Great review; sounds like a fun puzzle game. Shame it doesn’t have a demo. Thanks man. Yeah, too bad about the demo. This game could really use one.